Do you ever find yourself struggling to write content to connect and engage with your Blog Readers? Even though the internet has been around for a few decades, for some of us, it’s still a new frontier. I use blogging for online marketing and I write content that, I hope, is valuable to my readers. Sometimes, writing new content that’s valuable can be a challenge. 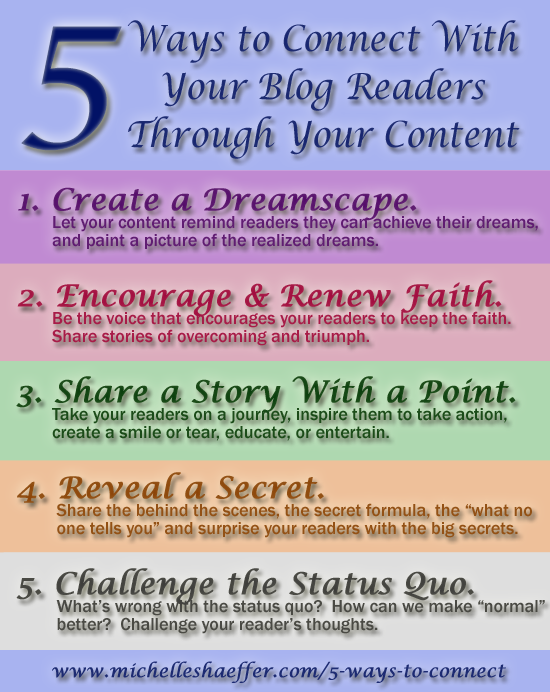 Michelle created an infographic, Five Ways to Connect with Your Blog Readers. These tips will help you with content for your blog and will keep you from blog rut for a while. I’ve challenged myself to write a post for each of these tips. I’ll keep you posted. Check out Michelle’s infographic below. And please share your thoughts. Like this infographic? Visit MichelleShaeffer.com to learn how to build visibility, voice, and community online. Where do you get ideas for content? Our blog venue in the TIGERS Den is business. So, my team is constantly looking through the news wires to determine if press releases are right for our readers. We like to make the news and break the news in ways that advance our readers skill sets or knowledge base. “You like to make the news and break the news” – I like that.The news wire will always have something of value to share with your readers.